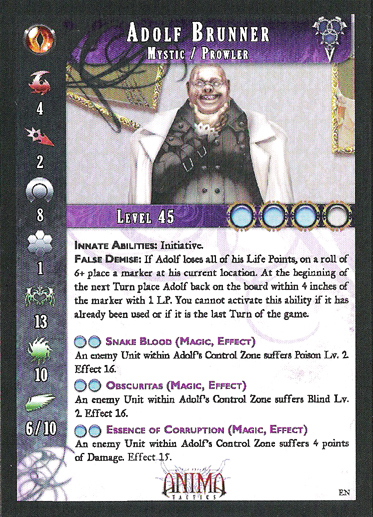 False Demise: If Adolf loses all of his Life Points, on a roll of 6+ place a marker at his current location. At the beginning of the next Turn place Adolf back on the board within 4 inches of the marker with 1 LP. You cannot activate this ability if it has already been used or if it is the last Turn of the game. An enemy Unit within Adolf's Control Zone suffers Poison Lv. 2. Effect 16. An enemy Unit within Adolf's Control Zone suffers Blind lv. 2. Effect 16. An enemy Unit within Adolf's Control Zone suffers 4 points of Damage. Effect 15. The monster that responds to the name of Adolf Brunner, known as "Loki" among members of Les Jaeger, is a cruel supernatural scientist who has corrupted his own body in exchange for power. He has earned the position of captain of the special forces of the Azur Alliance with his intelligence, cruelty and gift to manipulate the souls of his enemies. With little loyalty other than to serve his own interests and curiosity to experiment, Adolf Brunner is a truly repulsive creature.